First, while there are certainly some senior citizens who are unable to use a touchscreen, they do not represent the capabilities of all older Americans. (Keep in mind that 74% of seniors own some kind of cell phone.) Touchscreens are arguably easier to use than are the standard PC keyboard-and-mouse interface. Touching a screen is much less abstract than is moving a mouse with your hand on a horizontal plane in order to guide a cursor over an object on a vertical plane. As anyone with small children can tell you, touchscreens require much less dexterity than do keyboards and mice. The most recent information we have is a PewResearch report from May 2013. The report shows that 18% of seniors own smartphones and that 43% of seniors making over $75K own smartphones. Smartphone ownership among 55-64 year-olds is 39% overall and 72% for those making over $75K. Smartphone ownership among seniors grew by 38% from 2012 to 2013. 2014 and Three Years Hence When Pew updates their report later this year, what will smartphone ownership among seniors look like? We can make an estimation based on growth rate assumptions. Over the last year, did the growth rate of seniors adopting smartphones decelerate from 38% to 25%, stay the same, or accelerate from 38% to 45%? If the growth rate stayed the same, then in 2014 one out of four seniors own a smartphone. Healthcare folks who actually work with seniors in a clinical setting tell me that they are seeing even higher ownership rates. At modestly decelerating growth rates, the smartphone ownership rate will reach 50% by 2017. Given what we're seeing in the market, we're willing to stand behind these estimates. What about tablets, you say? Good question. I can't find any credible research that shows the percentage of seniors that own a smartphone or a tablet or both. An unscientific review of the seniors in my family shows a smartphone ownership rate of 50% and a smartphone or tablet ownership rate of 100%. I suspect the ownership rate of tablets or smartphones is higher than that of smartphones alone. 50% US population wold agree on using new options for one or more of 12 common procedure (e.g. DIY at home kits). This shift threatens 64B of traditional providers revenue. There are big opportunities for new entrants in the healthcare space, as an example 24 of fortune50 companies are considered new entrants. The revenue model for new companies is still unclear. But there are a couple of hints that could help the process of tuning the pilots. The new entrants should have fast-frugal-frequent failure models to test new ideas with minimal expenses. Also, new healthcare does not live in webpages or portals, it is mobile and lives in the cloud. It is estimated that there is 6 billion mobile phones in use worldwide (International Telecommunications 2012), this is an incredible number considering that the total populations is estimated to be 7.1 billion (US Dept. of Commerce). In the US 59 % of adults are users of mobile internet. Low income and non-white use phones as their only access to internet (Purcel et al. 2010). Mobile apps generate 466.000 jobs in the US and produce $20 billon in revenue (Rockwell2013). The cost of developing an app is in the range of $8000 - $100.000. Mobile apps have not yet a proven business model to guide entrepreneurs and there is little evidence in monetization. The core driver of healthcare culture is physicians, the relationship of physicians with technology is questionable. For example 62% of physicians do not share emails with their patients. The average time for a significant healthcare innovation to become a standard is 17 years. This is mainly due to the resistance of physicians to change their practices and professional habits (Wislow 2013). The physician's greatest source of power over the years has been their relationship with the patient. Physicians have used the relationship to escape corporate control and retain professional independence and authority (Starr 1982). In mHealth, 42% physicians worry that mHealth takes patients too independent of them. 27% physicians encourage mHealth and 13% actively discourage it. 24% of younger physicians (5 years of experience) discourage mHealth (Levy 2012). 53% physicians report that personal mHealth Apps. work with their organization. In the next 10 years mHealth will make savings of 305 billion US by reducing the travel time and expenses, faster communications and decision making. Remote monitoring alone ﻿is expected to save close to $200 billion﻿ in the next 25 years by managing chronic diseases (Levy 2012). 1 in 5 adults has a wearable. 1 in 10 uses it every day. Software for these devises is very basic. Few people is interested in sharing health data with friends and family. Nevertheless, they can do it with the right motivation. For example, 1 million users are sending data to Wallgreens every day in exchange of points. Consumers were asked ow likely they are to purchase the following technology in the next 12 month: Fitness Band 45%, Smart watch 35%, Smart clothing 20%, Smart glasses 19%, tracking device 13%. What information do people want from wearables: Smart exercise 77%, Collect and track medical information 75%, eat better 67%, find retail deals 46%, controlling home appliances 32%, access to entertainment 29%, plugging into social media 26%. 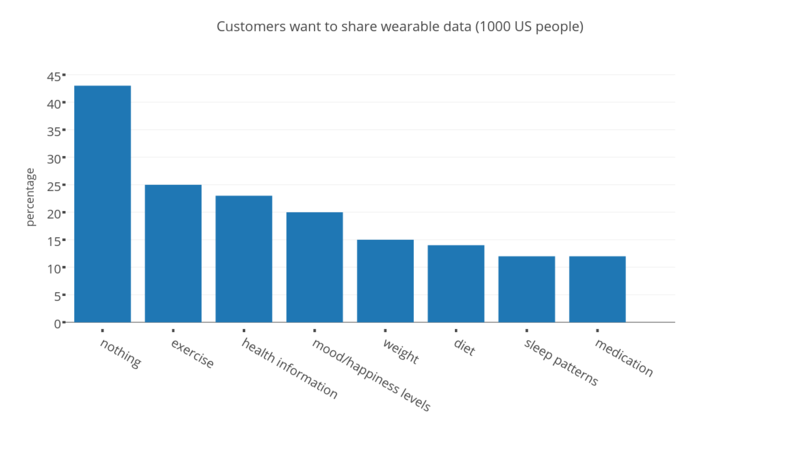 What data would customers want to share: nothing 43%, exercise 25%, health information 23%, mood/happiness levels 20%, weight 15%, diet 14%, sleep patterns 12%, medication 12%. Consumers remain concerned about their privacy. Consumers were asked who they trust to hold their wearable data , they ranked they primary care doctor at the top of the list (54%). Then it follows in order: the health insurance company (Medicare, Medicaid), the hospital, tech company, the bank. The smartphone remains the most popular potential medical device used by the average consumer today - isn't worn but instead resides close by in a pocked or purse -. Wearables will need to provide more than just data. They will need to provide useful insights, be interoperable, integrated, engaging, social and outcomes driven. Investment in the software side of this industry will be as important as hardware. Organizations will need to develop curation services to direct consumers to high-quality devices and apps.